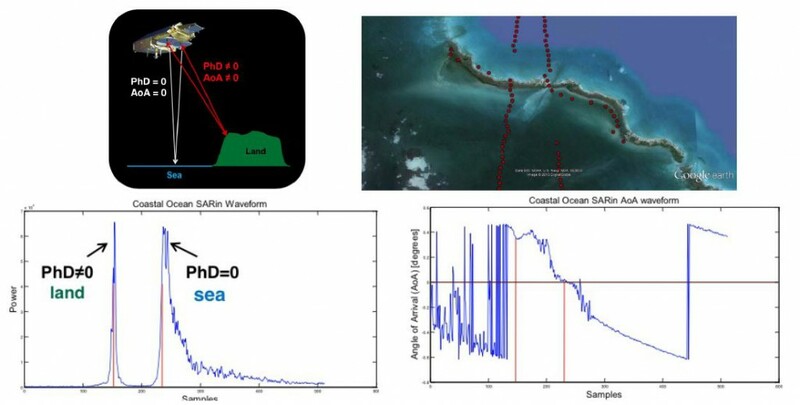 CryoSat-2 offered the first ever possibility to perform coastal altimetric studies using SAR/SARIn altimetry. With this technological leap forward it is now possible to observe sea level in very small water bodies and also to provide coastal sea level very close to the shore. The advantage of the SAR data compared with conventional altimetry is the fact that the increased spatial resolution of SAR, along-track, provides valuable sea level observations. 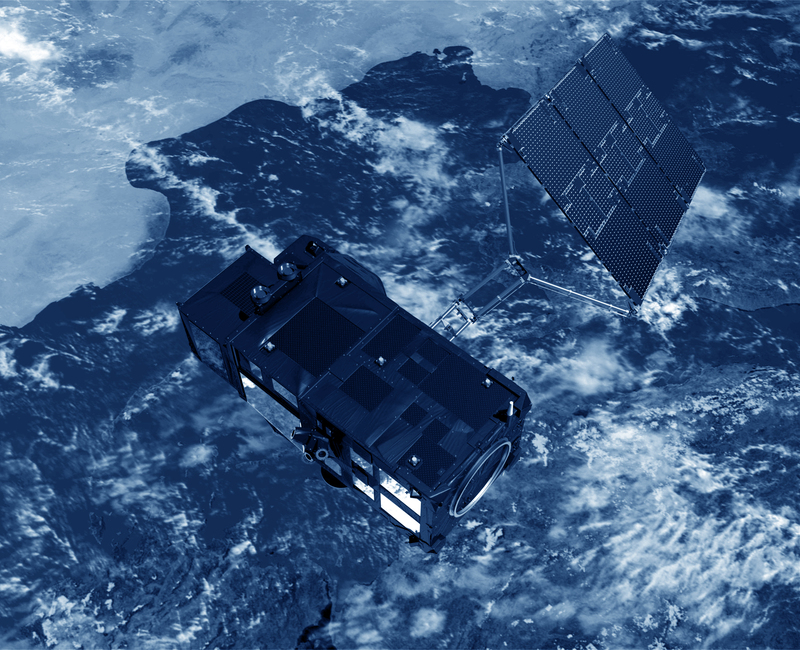 Different ESA-EU funded projects have been carried out to evaluate the performances of the CryoSat-2 data near the coast (LOTUS, CP4O) some of them (SCOOP) already aimed at Sentinel-3. The main conclusions are being presented each year in the Coastal Altimetry Workshop series. 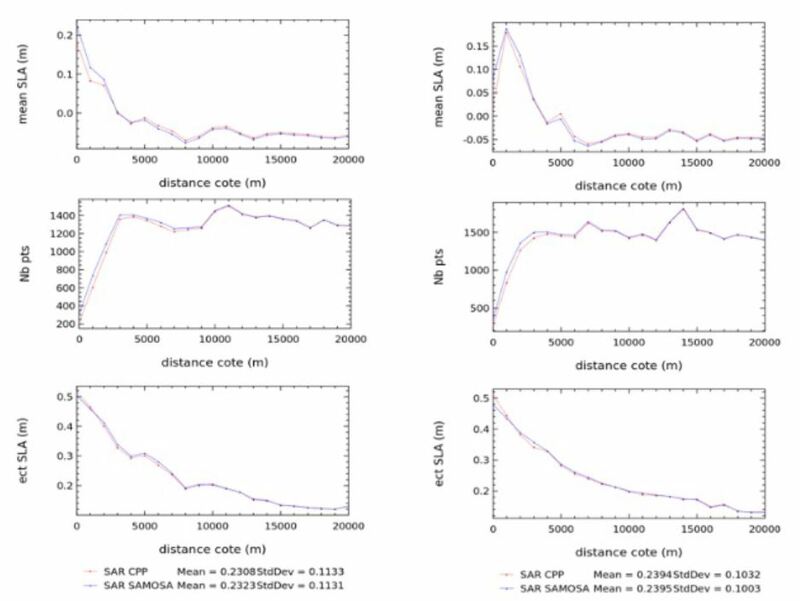 ESRIN implemented a number of versions of the SAMOSA retracker for validation in CP4O, as described in Table 1. Some of them are available to the public through GPOD. Additional info can be found in the following link. In addition to the evaluation of SAR altimeter data in the open ocean, NOC carried out an assessment of capabilities of SAR altimetry in the coastal ocean (Gommenginger et al, 2014). 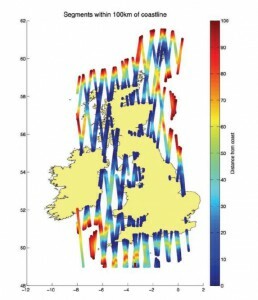 This validation study was carried out on the ESRIN R1 data set (the full implementation of the SAMOSA-2 model), at locations close to the sites of UK coastal tide gauges. The data set available was limited in time and was not long enough to include any repeat visits to any of the locations, and an initial attempt at match ups showed large offsets which varied from pass to pass. The analysis was therefore limited to assessing the availability of valid data, and of the noise levels on these data. An analysis of a longer times series will be needed to allow a comparison between tide gauge and SAR data measurements (e.g. of Total Water level Envelope – a parameter relevant to tidal surge studies). Segments of the R1 CryoSat SAR validation data set that lay within 100km of the UK coast were extracted, and values for the Total Water Level Envelope (TWLE) calculated at 20 Hz intervals (TWLE is calculated as the SSH, with all relevant atmospheric corrections applied, and inclusive of ocean tides and atmospheric forcing). The noise level on the TWLE estimates was calculated as the absolute difference between consecutive measurements. This is believed to provide a good proxy for measurement noise, as the spatial separation between consecutive measurements will be ~300m, so the sea level should only be different by an order of mm. The figure below shows the results, for all data, and for data selected according to waveform misfit < 3. In the left panel, it can be seen that the median of the absolute differences remains at 5 cm to within 5 km of the coast. Assuming that the noise is Gaussian, with variance of 2σ2, then the difference between adjacent samples will have a variance of 2σ2. Thus a median absolute difference of 5cm is equivalent to a noise level of 3.5 cm for 20 Hz data, or 0.8 cm for 1 Hz data. This remarkable low noise level can be achieved to within 1km of the coast if the data are more carefully filtered according to waveform misfit < 3 (right panel), though of course the number of data being included in the calculation becomes significantly less (under 25% at 3km from the coast – see bottom right panel ). Raynal et al (2014a and 2014b) also looked at the performance of the different SAR products close to the coast, and found very little difference between R1, and R6 SAMOSA products and the CPP product, in terms of the mean calculated Sea Level Anomaly, the number of valid points (per km), and the standard deviation (figure below). fig 3.Sea Level Anomaly (top), number of points (middle), and standard deviation of SLA (bottom), for CPP SAR (red) and SAMOSA R1 SAR (blue) data with distance from the coast. For ascending (left) and descending (right) passes on tracks close to the UK. Note that Dinardo et al., (2014) also assessed the capability of CryoSat SAR mode data in the German Bight, using data processed with the SAMOSA retracker. This work was carried out outside the CP4O project, but was reported to CP4O. The study found that CryoSat SSH, SWH and wind speed measurements were consistent with those in the RDSAR products, and the SWH and wind speed measurements were also consistent with buoy and model data. Although further work on a larger data set is necessary, it can be concluded from the CP4O analyses that the SAR product can provide low noise estimates of Sea Surface Height, and parameters derived from SSH (SLA, TWLE) to within 1 km of the coast, if the data are filtered appropriately. It has not been yet possible to investigate the relative performance of different processing schemes in this aspect. A comprehensive evaluation of CryoSat SAR data in the coastal area should be carried out. This is one of the objectives of the SCOOP project, using CryoSat data processed following the Sentinel-3 baseline. Garcia et al. (2014) describes the short scientific study that was carried out into the use of SARin data from CryoSat to provide insight into the potential for SAR altimetry in the coastal zone. This study made use of data from the SAR Interferometric (SARin) mode of CryoSat, whereby a second antenna is used to receive the reflected signals. The two antennas are mounted perpendicular to the direction of flight, so the across track information is provided. The relative phase information from the two antennas allows the angle of arrival (AoA) of off-nadir across track echoes to be derived. In the example of the figure below, the SIRAL has received a direct nadir echo from the ocean surface and an off nadir echo from a reflector on land. Because of the elevation and brightness of the reflecting facet on the land, the land echo arrives earlier, and has a similar power, to that of the nadir ocean echo. echoing locations identified. (Bottom Left) Power waveform, showing land echo received before ocean echo, and (Bottom right) phase waveform. The two red lines identify the position of the first echoes from the land and ocean reflectors. The purpose of the study described in Garcia et al., (2014) is to build an approach that can be used for processing SAR mode data which will distinguish and minimise the effect of the contaminating land echo. SARIN for two areas was requested, one region covering the Cuban Archipelago, which includes coastal cliffs and offshore cays, in general lying roughly perpendicular to the CryoSat subsatellite track, and a second region close to the Chilean coast, where the coastline (predominantly cliffs) lies closer to parallel to the CryoSat sub-satellite track. fig 4.The two SARin regions considered, (left) the Cuban archipelago, (right) the Chilean coastal strip. The existing L2 processing often selects and retracks the off-nadir land echo, which can arrive earlier and be of similar higher power, and so returns an erroneous range. Thus a modified L2 processing scheme was developed that took as input L1 power, phase difference and coherence waveforms and through an iterative process identified the true nadir echoing point. The processor then used this true echoing point to provide a “seed” to a purpose-built retracker which returns the true range of the nadir echo, together with the latitude and longitude of the nadir echoing point. retracking fitted waveform is shown in red. The figure above shows the result of using this modified processor on two sections of SARin data, the first across the Cuban Coast and the second close to the Chilean coast. In both cases the original processing wrongly tracked off nadir echoing points and so returned SSH values that could be ~10m in error (red). The new scheme provided much improved retracking (yellow), though not with a 100% success rate. The algorithm was tuned by running it across a large number of tracks, selecting processing tolerances that provide the best results in most circumstances. As some trade offs were necessary, it was not possible to design a general scheme that worked for all cases. This activity therefore demonstrated that the existing SARin processing scheme was returning incorrect SSH values, by retracking on non-nadir echoes, in a significant number of cases in the coastal zone, and has developed an improved scheme to minimise the contamination from non-nadir echoes. Further improve the modified SARin processing scheme to fine-tune the retracker seed production and the retracking solution itself. Produce a test data set for coastal zones to support the development of improved SAR coastal zone retracking solutions. Adapt the SARin processing approach for application to SAR data to improve retrieval of ocean parameters (especially sea surface height) from tracks over complex coastal topography.